Mom: "my goodness.. what is this mess on the floor? -what on earth is this?" (me! ): "oh.. that.. did i forget to clean that up?" Mom: "yes. But honey what is this..?" (me! ): "oh.. -that's oven cleaner." Mom: "are you serious? 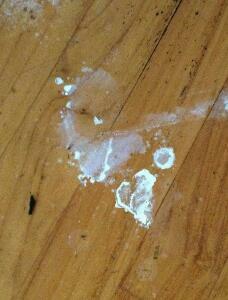 what is oven cleaner doing all over the floor.. its for the oven.. "
(me! ): "i had to use it as spider killer spray... "
Mom: "You are not serious...."
My sister: "oh.. I'm pretty sure she's serious.."
(me! ): "only it didn't kill 'em.. so I had to drown 'em.. "
my sister: " I can." (me! ): "and then I couldn't seem to drown him either.. So I dropped matt's book on top.."
Matt: "that's the first time my geography book has been of any use.."
(me! ): "I didn't realize I forgot to clean it up.."
My sister (?).. "look.. there's a shape of a heart.."
(me! ): "I don't have my camera.. "
Mom: "well, I can take it for you.. that is a heart isn't it.. I can't believe..."